​​LANZA charts the life of sensational 1950’s singer and movie star, Mario Lanza. More than a tribute show, he comes alive to set the record straight, weaving together personal reminiscence and song. In a hospital room in Rome, inspired by a scratchy Caruso record, Lanza’s life flashes before him. He is tended by his nurse; who comes to embody all the women in his life. The drama examines the nature of fame and asks why a man, who seemingly has the world at his feet, spirals out of control. Andrew Bain's musical-opera punctuates the compelling drama of his life with the music which made him famous. The operatic hits and lighter classics include E Lucevan le Stelle, Granada, You’ll never walk alone and Mario Lanza’s most famous song, Be my Love. "A stirring Granada…Bain’s versatility and courage to admire"
"Andrew Bain, with the physique of an Italian boxer and enough alpha male body language to send the whiff of testosterone right up the audience's nostrils"
"Bain recreates with marvellous energy the anxious wanting of an aspiring talent. He captures Lanza's innocent zeal and his portrayal is at times both wretched and tormented"
"A tour de force hits all the right notes"
Andrew studied Dentistry at Bristol University before embarking on a professional singing career, first in musical theatre and then opera. He studies in London with Jennie Caron. Recent opera credits include Cavaradossi in Tosca (Surrey Opera), Don Jose in Carmen (King’s Head), The Duke of Mantua in Rigoletto (Opera Novella), Tamino in The Magic Flute (Opera Brava) and Edmondo in Manon Lescaut (Chelsea Opera Group). 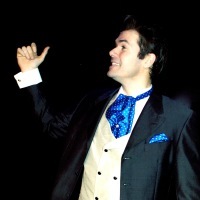 Previous Opera credits include, Lensky in Eugene Onegin (Candlelight Opera), Don Jose in Carmen (Pimlico Opera), Joe in La Fancuilla del West (Grange Park Opera), Ferrando in Cosi fan Tutte (Opera by Definition), Pierre in The Wandering Scholar (St John Smith Square), Eisenstein in Die Fledermaus (Alternative Opera), Triquet in Eugene Onegin (Longborough Festival), MacHeath in Beggars Opera (Cochrane Theatre), Peasant Leader in Eugene Onegin (Opera by Definition) and he was a member of the ensemble in Bluebeard, Falstaff and L’elisir d’Amore (Grange Park Opera). While studying at Bristol University he played Don Jose in Carmen, Spalanzani in Tales of Hoffmann as well as Ralph and Fairfax in HMS Pinafore and Yeoman of the Guard. As a musical theatre performer he played the role of Lancelot in Camelot (Surrey Opera), Tony in West Side Story for Pimlico Opera in HMP Wandsworth, Les Miserables (No1 UK Tour), Whistle down the Wind (No1 UK Tour), Beauty and the Beast (Watermill Theatre), City of Angels (Landor), Merrick (Pleasance) and Tonight (Peacock). He has also premiered the English version of a new Norwegian one-man musical, Terje Vigen in San Francisco and on tour in Norway. Other notable engagements include tenor solo in a Requiem Mass by Rowland Lee, at the St Petersburg Philharmonic concert hall, alongside Sarah Connolly CBE. He has also performed his self-written one man show, LANZA; a drama with music about the life of 1950’s tenor, Mario Lanza. It ran for a month at the King’s Head Theatre in Islington gathering excellent reviews, plans are being made for further productions. In the corporate arena, Andrew has performed all over the around the world including LA, San Francisco, Rome, Bergen, Istanbul and Belfast. He recently sang at the Royal Palace in Oslo for the King and Queen of Norway at their daughter’s 40th Birthday celebration attended by many European Royals. He has sung live on GMTV and even performed at Bestival on the Isle of Wight. In 2008 Andrew signed a solo recording contract with SonyBMG and has recorded an album of “classical crossover”.